I had heard about this book ever so long ago and stumbled across a copy in Goodwill last week. It took me all of two seconds to throw it into the cart and keep walking. This had been on my "want to read" list for awhile but I had forgotten all about it. I wasn't disappointed by the wait and I do think God's time on pretty much all books is perfect. This book kinda covers a gamut of topics and inspirations and it's hard to explain the main point except for the obviousness which the title suggests. 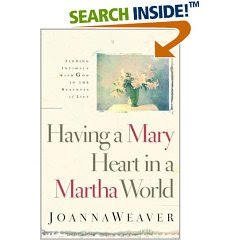 Weaver focuses the book on Mary, her sister Martha, and their brother Lazarus. The emphasis of the book's message is that we need to choose "the better" of what God wants for us in our lives. Are you so rule/duty focused that you miss out on sitting at the Master's feet and learning more of Him? That's her starting question. However, the book wraps up by questioning both halves. Are you so much a Mary that you say no to service when you are called upon for it? She concludes nicely that following Christ is about being balanced. It is about serving and worshiping. Both are essential and both are a Biblical command. The closer we grow to Christ, the more balanced we should become. She also affirms that learning to be a balanced Christian is never easy. God takes us through mountains and valleys. He promised we would visit both. For either Martha or Mary to stand up and announce that they "had it all" would be a sin in itself for no human is perfectly balanced. The beauty of God becoming man was that we finally had the example of the perfect man (the perfect God-man). He is our example and hero and the One we are to be imitating. Instead of beating each other over the head with who is right and who is wrong and what it means for each individual to be either a Mary or a Martha is a pointless waste of time. What we should be doing is spurring each other towards finding out who God wants us to be in Him. God's Grammar Rule #1: Never put a period where God puts a comma. God's Grammar Rule #2: Don't put a comma where God puts a period. We want to define God but He must define us. Rather, we must be defined in and through Him. Instead of being upset with Who God is and how He acts and what He demands, we might instead bow to His good pleasure so that His glory might be seen in our world today. Weaver gives the example of the blind man who was healed with spit and mud, and of Lazarus being raised from the dead on the fourth day. Man defined God and God blew the definition of Himself out of the water - REdefining what He was all about. Too frequently I put periods where commas exist and vice versa. I was encouraged by this book to stop from my busyness and ask God what it is He is wanting to do in any situation I might happen to encounter. If I had to define myself according to this book, I'd say I'm an extreme Martha who is really trying hard to find some more balance on the side of Mary. I've a long way to go. But I'm on the right road and am glad of that. I'm also glad of this book and for how Weaver motivates and encourages while she instructs (which loads more scripture that I have not even attempted quoting here). One day I'll get it. I'm not there yet. But I could use a nudge every now and again and this book gave me that which I needed. I liked this book and would suggest that there are quite a few women who might find value in the message. It's worth the time and effort to read. It's one of those practical reads that will either speak to your heart and wow you a bit or perhaps will only cause a nod or two. Worthy focus, but in God's timing. His timing was right for me with this one. Hmmm. I have no idea where I am in the Mary/Martha scheme. I certainly get caught up in my routine, but I'm genuinely terrified of trying to put my own plans before God's. Food for thought. Thanks for the review. Great review -- this is one I have seen a lot, too, and thought I probably should read "some day."